Coming from an Italian family, escarole soup or Italian Wedding Soup was one of my favorites growing up. Well, to be honest, I only ate the meatballs and drank the broth. Floating eggs and green stuff? No way. But as I got older I learned to appreciate it and now come to think of it as one of my many Sunday dinner comfort foods my grandmother used to make. 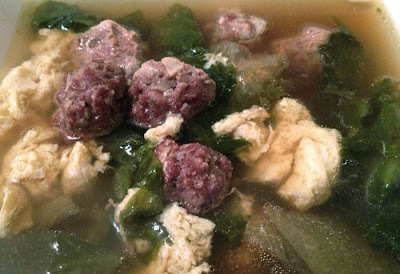 Traditional escarole soup is chicken broth base, escarole greens, mini beef/pork/lamb meatballs and eggs mixed with parmesan. There are tons of other versions that include orzo, white beans and even shredded chicken. None of them compare, but to each his own. For our purposes, we will leave out the evil grains and beans. And for those of you who are strict paleo, leave out the parmesan if you must. I wouldn't but I'm a recovering cheese addict therefore my opinion is a tad bias. Also, if you don't have ground pork and lamb, plain ground beef or turkey will work just as well. In a large pot boil the escarole in salted (just a shake or two) water for 15 minutes. Drain and reserve 1 cup of the water. (this will kill some of the bitter taste) If you don't mind it or don't have time, it's ok to skip that part. In same pot fill with chicken stock, reserved water, escarole and cooked meatballs. Bring to a rolling boil then slowly pour in the beaten eggs in a circle. Let the eggs rise to the top then gently break up large clumps with a spoon. Don't mash them to death, just break them up. Cover, reduce heat and let simmer 20 minutes. Taste and adjust the salt and pepper. The longer you let it sit the better. So if you say, have a wod to do and it ends up being 45 minutes, (poor you) it's ok to let the soup lightly simmer. In the glory days I would have served it with a nice heaping piece of crusty baguette but, times have changed. For most of us Crossfitters, it probably won't be enough to eat alone as a main meal unless you're looking to go light that particular day. I mean, what soup is that filling that doesn't have cream or cheese or potatoes in it? So I would probably serve it as a side or starter along with a nice lean piece of meat or seafood. *The chicken stock was homemade in this case. I suggest either making your own or buying a brand that can really stand up to the mug test. If you can't heat broth up in a mug and drink it alone, you shouldn't be cooking with it. And certainly not making soup with it. I'll post the chicken stock recipe later today or tomorrow if I get a chance.